What? I never thought that this aspect of technology would grow into what it is now, and what I’m sure it will turn into something even greater as our society progresses. My whole life revolves around sports and sports journalism. To me, the opportunities are endless when it comes to the different experiences people can create involving shooting sporting events in VR. 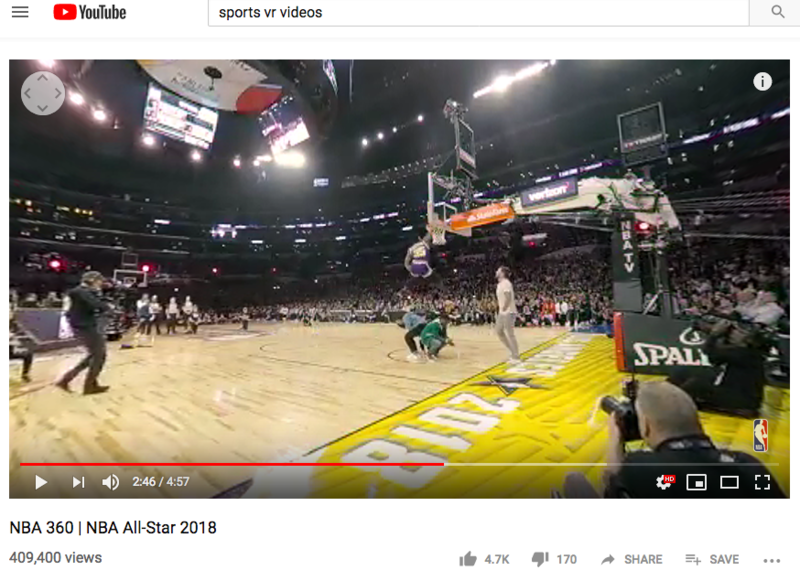 I went into YouTube and typed in, “Sports VR Videos” and low and behold, last March the NBA filmed and produced a nearly 5-minute highlight reel from the NBA All-Star game in Los Angeles (and all of the behind-the-scenes festivities that came with it. 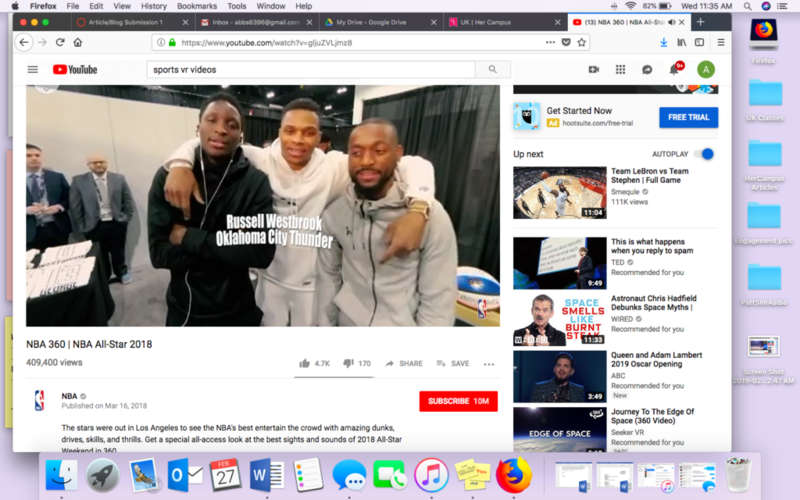 The video provided us with special access that we would more than likely never get, (unless you’re on the NBA beat for a major news outlet). This provides die-hard NBA fans an exclusive look at a big weekend for the league without breaking their wallet, which I’m always a fan of. 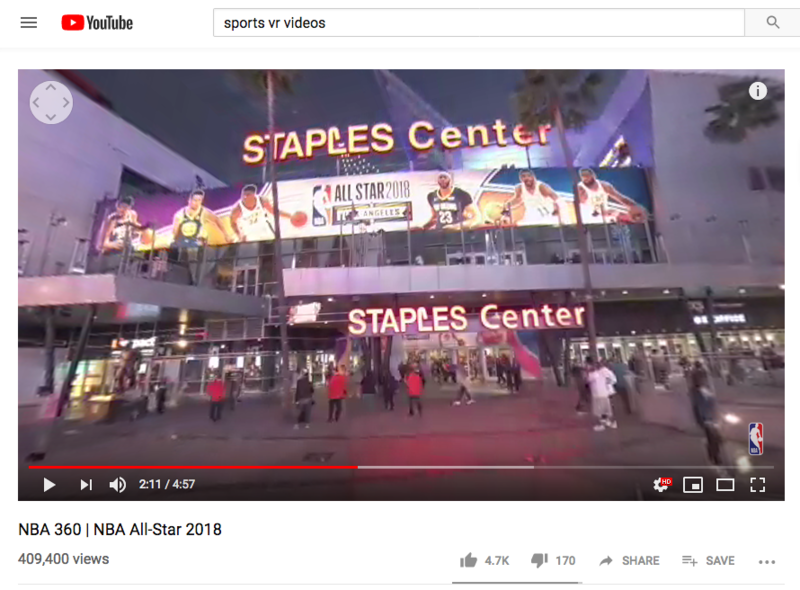 The video incorporates interviews with players that are participating in the NBA All-Star game, such as: Klay Thompson, Shaquille O’Neal, Devin Booker, Donovan Mitchell and so many more. This video did have a beginning, middle and an end. It started out with an establishing shot outside of the Staples Center in LA where all of the festivities were held. We had footage of the participating players arriving to the arena. 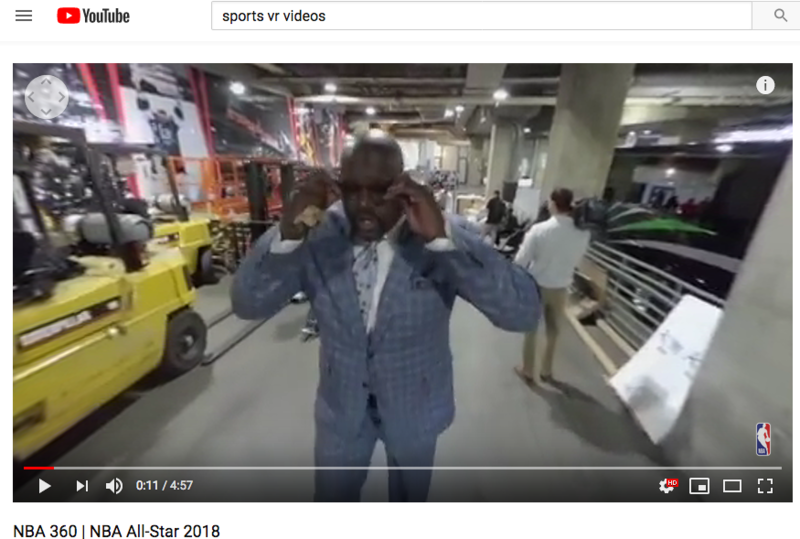 Something that I thought was really cool was we saw footage of Shaq walking into the arena and he introduces the event, he then says, “Put your goggles on now,” and then he puts his sunglasses on. Very creative! We then transition to footage of the players participating in team photoshoots before the three-point contest and we hear from Klay Thompson about he’s feeling before the contest because this is his first time participating in it. After that it was time to get ready for the dunk contest. There was footage of a pre-contest interview with Donovan Mitchell (who ended up winning the contest), and then it transitioned into footage of Mitchell’s contest winning dunks. Again, we still had the same issue with not really being able to see Mitchell’s dunks, but the view was better than the three-point contest because this took place closer to the basket. The video wrapped up with footage from the NBA All-Star game, LeBron James’ team vs. Steph Curry’s team. 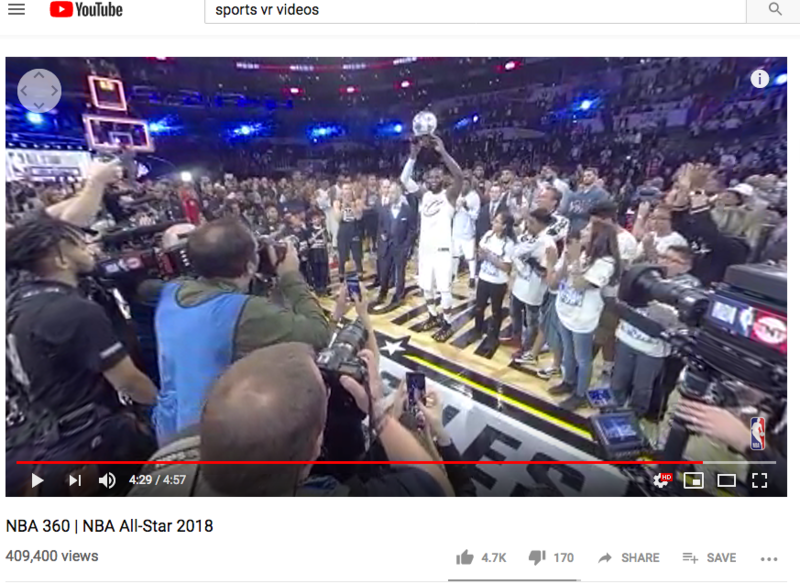 I personally didn’t think that the footage that took place during the game was the greatest, but I did enjoy the on-court access we saw after James’ team got the win. We also saw James be presented with his MVP award—got to be up close and personal during that, which I’m sure all LeBron fans appreciated. Overall, I thought this was a good experience and I thought it was appropriate to shoot this in VR, solely because it hadn’t been done before during this particular event. As VR become a more respected creative tool, we will be granted with the same access for 360-cameras as regular cameras. 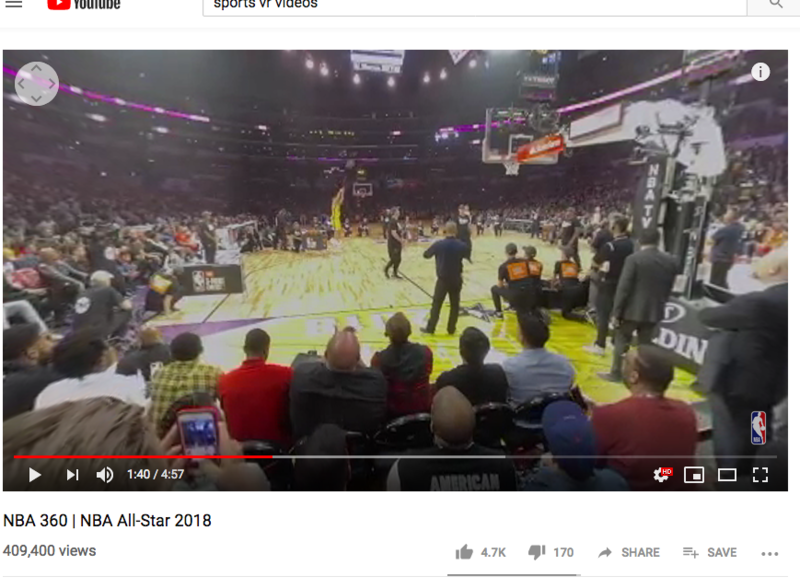 This was the first 360-degree video that I have seen produced by the NBA. They do have a whole playlist on their YouTube page that is solely 360-degree videos. 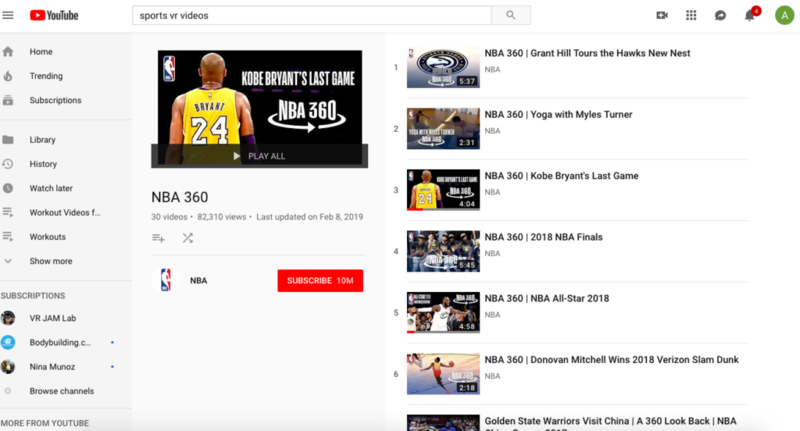 If you like the NBA and you like watching videos with a VR headset, then this channel might be worth checking out when you have spare time! 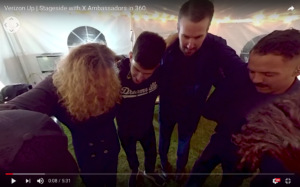 This VR experience showcases a view that not many get to see – an onstage look at an X Ambassadors concert. This video was posted to YouTube and produced by Verizon. The company wanted to show what people will see when they attend this concert, and advertise that they tickets as well as exclusive access packages for this concert series. The video is doing very well as far as feedback goes. It was only posted two weeks ago, and it already has over 2 million views with lots of likes and comments. Many commenters seem to be fans of the band and that is what drew them to the video, but they commented on how seeing it in VR was exciting and different. There is not much of a storyline here because I think the producers were trying to excite people about the experience. I liked how the video started by putting the viewer in the center of the band’s pre-concert huddle. They prepped for their show by what looked like a prayer ritual that seemed very special to the entire group. I liked how the video started with that, because it gave the viewer a little bit of insight on the band’s interests before they watched them play. If the video hadn’t started with that, it would have been difficult for me to be interested in their show. Showing that at the beginning of the video was definitely what drew me in and made me continue to watch. This was probably the only use of emotion throughout the entire thing. It is probably more of an emotional video for fans of the band, or people who have never seen them in concert but really wish to. For me, after that first sequence, I didn’t really feel any emotional attachment to what was happening. This video was definitely experience driven. You could tell not only by the lack of narration and plot, but because the editors continuously changed the camera angle in order to keep the viewer alert and interested. It also showed a lot of very exciting moments in the concert, like when the entire audience started to wave their arms in unison, and when the lead singer jumped up on the barrier and then crowd surfed. I do think it was appropriate for VR, because every time you go to a concert, you see what’s in front of you – the performer. I think the view of the audience, probably at every concert, is much more impressive. When there are thousands of people close together singing, dancing and cheering for whoever is on stage, that is a show in and of itself. As concertgoers, we never get to see this view, and it is one worth noticing. Concerts are beginning to become the focus of a lot of new VR work. Here is an article that explains the first live Oculus VR concert. I think I would have enjoyed this VR concert video more if it was edited differently. The lead singer serves as the main character, and he is a very good performer in that he is never stagnant. He is always moving and giving the audience something interesting to watch. However, it was difficult for me to follow him because the camera angles switched in the video so frequently. If the angles were shown for longer, it would have been easier for me to pay attention to where he was and follow him while he was performing, as the audience does. This is Live Nation Concerts’ VR page. Here they have VR videos of several of the artists they pair with to host concerts. 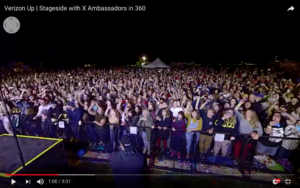 I enjoyed looking at a couple of these videos after I had watched the X Ambassadors. In comparison, I like the way the Live Nation videos are edited, because it is easier for me to look around and really absorb the environment I’m placed in. In total, I think this video is accomplishing what it was made for. Verizon made this video to promote their App for ticket sales and concert information. In terms of VR quality, I think it could have been edited better in order to keep the viewer more interested and more engaged. 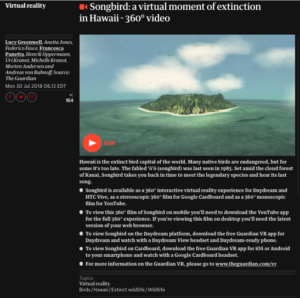 The Guardian released Songbird: a virtual moment of extinction in Hawaii on July 30, 2018. It is a virtual reality experience set in Kauai, Hawaii in 1985. The experience traces the footsteps of scientist, Dr. Jim Jacobi, and recreates his interaction with the last ʻōʻō (songbird) ever existing on earth. Lucy Greenwell is the director on the project and Anetta Jones is the producer. Francesca Panetta, who is executive editor for virtual reality at The Guardian, is the executive producer on the project. Finally, Federico Fasce is the lead developer and creative technologist for the video. A glimpse at The Guardian post. The story is experimental, for it is an instance where there is no actual footage to go along with the audio, so an animated version of what the actual footage would have been is created. The footage puts you into a part of history that no longer exists and makes it feel real with the use of natural sound and documentary-style narration. There are times, however, the video can start to buffer and the graphics can get a bit blurry, so make sure your internet connection is strong when you are watching the video or you will have grainy footage and the birds will become indistinguishable from the background. Personally, I had difficultly loading the video even when I had strong connection. The video would not load on my phone, for my phone was not equipped with the latest update. Therefore, if you are trying to watch the video on your phone, make sure your phone is updated to ensure optimal performance. If you are viewing it on your computer, your computer must also be updated to ensure optimal experience. I would also advise giving the video time to load prior to watching it as well, for the video is a bit long. Though lengthy, the project is an example of great storytelling scripted appropriately for virtual reality. It takes you on a realistic journey. There is a conflict, for you are following Dr. Jacobi in his search for the last songbird, while at the same time you realize the songbird is searching for a songbird as well or its species will die out. The way the story is told in the video evokes emotion from viewers and causes the viewers to empathize with the songbird. Not only does the viewer empathize with the songbird, but it causes the viewer to look at the bigger global issue of bird extinction. Along with great natural sound, the story utilizes insightful audio from Dr. Jacobi to describe the things he experienced first hand. The path of the scientist can’t be explained by the narrator since the narrator was not there at the moment in history in 1985. I also enjoy the use of captions in the video. The opening captions create a setting for the video and explain to the viewer what is about to be viewed. The closing captions give insight into the problems that still face the bird population and what the issues stem from. At around 2:00 of the video is an example of great use of interview clips to tell a story. Dr. Jacobi gives background knowledge from experience that only he can provide. Above is an example of a caption used in the video. Altogether, I believe the story is well-executed. It is a well written, interesting story. Being eight minutes, it is a little long, however I feel the story is entertaining and captivating enough to keep viewers engaged. It is a good example of how virtual reality can be used and a glimpse as to where virtual reality may be headed in the future. 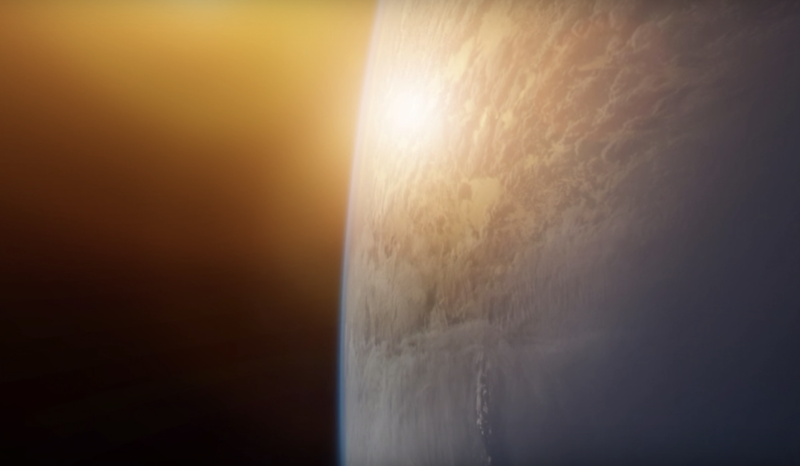 “I took a look at the planet at just sort of let it sink in. I thought to myself, ‘this is something that human eyes are not supposed to see. This must be the view from Heaven.’” When Mike Massimino along with three other astronauts boarded the space shuttle, they were not prepared for the life-changing events that would take place as they graced the galaxy above. 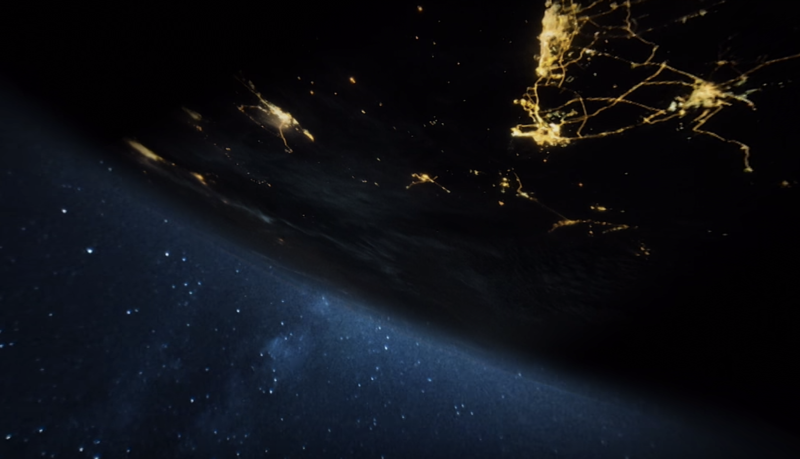 National Geographic’s One Strange Rock– the first ever VR filmed in space- lets viewers experience first hand what being in zero gravity is like. 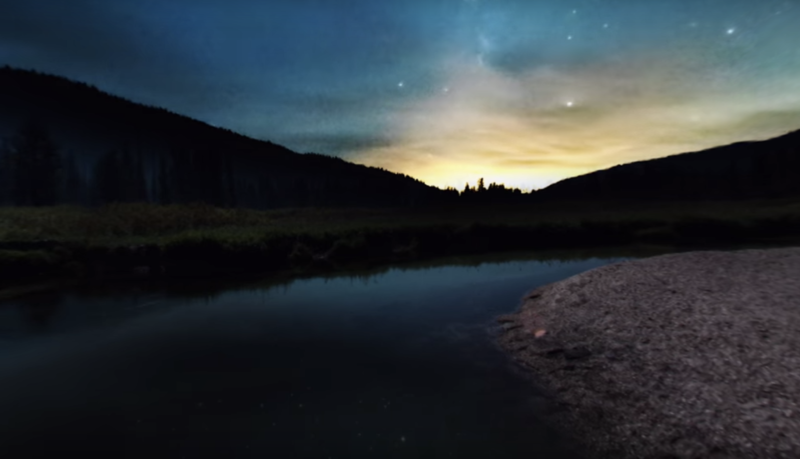 Award-winning filmmaker Darren Arnofsky was able to capture the beauty of the planet with the Vuze 4K VR Camera from Humaneyes Technology. 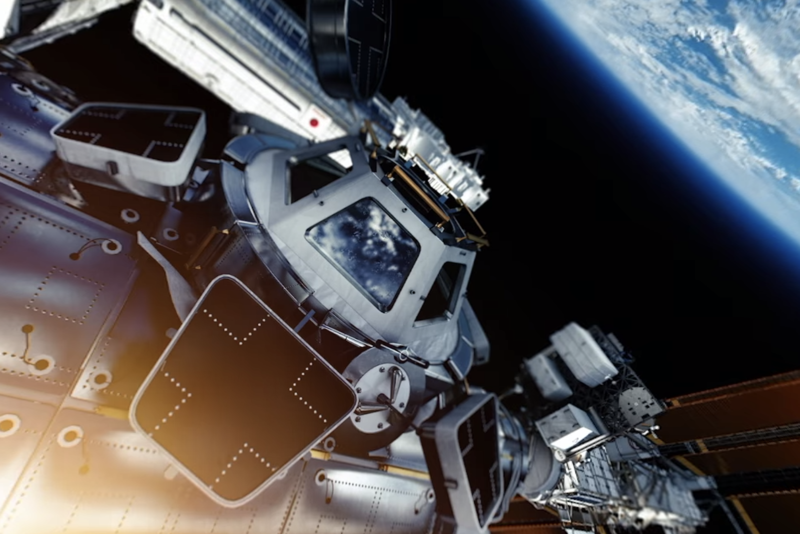 The compelling narratives from the astronauts paired with breathtaking 360 views of our planet make this virtual reality story innovative and extremely emotionally effective. This piece is not solely about being in space. There is no guided tour, facts about the sun, or asteroids flying past us. Instead, viewers are forced to simply be still and notice. The way the video is able to evoke emotion so well is through the storytelling technique- the strongest part of the piece. The astronauts each voiced-over a section of the video, elaborating on how their perspective of earth changed after viewing it in person. 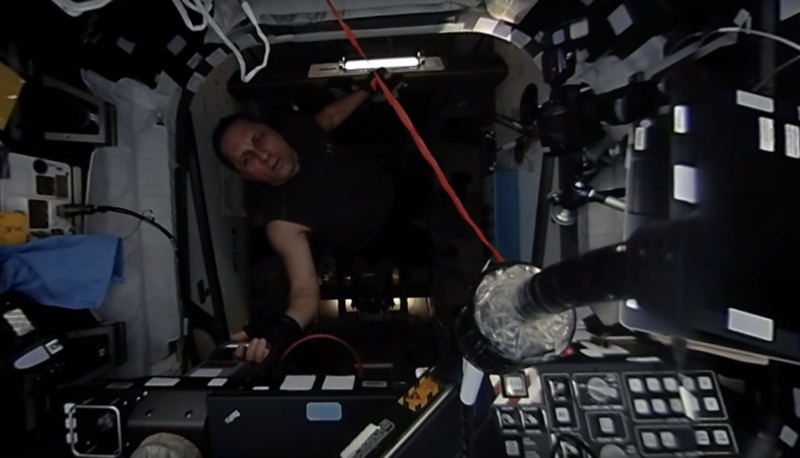 Using astronauts to narrate allows for an intimate tone throughout the video. Their individual stories guide us toward the overarching theme of appreciating the beauty of the earth and life itself. This use of an intimate tone helps reveal connection we as human beings have with each other and the earth. If a starker tone was used instead, it would have the complete opposite effect and make us feel disconnected and the mystery of the earth more remote. We are presented with 360 degree immaculate views of space, view of the interior space shuttle, and different atmospheric landscapes around the world. 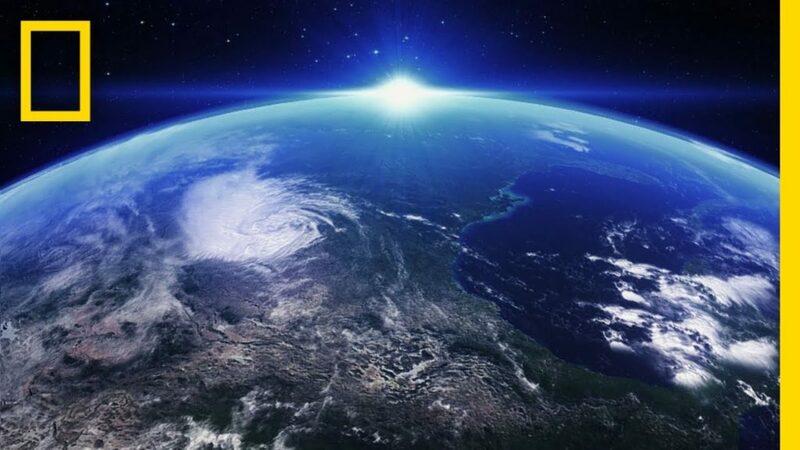 We feel a sense of enlightenment and gratitude for our amazing world by the end of the video. Ultimately, there were no flaws in this piece. The video is appropriate for all ages, and the storyline is unique as are the visuals. The story being told in Virtual Reality is essential to the piece. We have seen several photographs of outer space throughout our lives to the point where we have become desensitized to the fact that there is an entire universe floating above us. However, reintroducing the universe using Virtual Reality brings back our awareness and curiosity that some have lost. Of course the amazing 4K quality drastically helps immerse the viewers too. Seeing textbook style photographs of the moon may feel repetitive, but actually feeling like you can reach out and touch the moon may open our eyes a little wider. We can become inspired and educated about the earth with a fresh eye– future generations are going to have a powerful learning device in the classroom too. One Strange Rock is an example of innovation in Virtual Reality. The 3D visuals and creative use of narration by the astronauts makes for a nearly unbelievable virtual reality experience. Incomparable to any other Virtual Reality story I have seen, One Strange Rock a definite must watch. 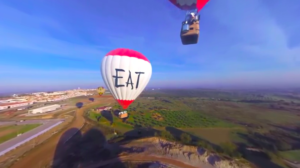 Last winter, Chick-Fil-A released a series of advertisements promoting their infamous message, “eat mor chicken” through their website leading to a 360 video advertisement. 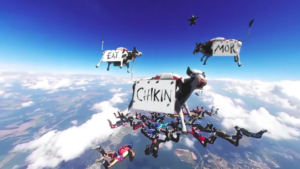 The main 360 video advertisement of the series, produced by Chick-Fil-A and enjoyed by customers of all ages, was successful in that it was of good quality and it was entertaining to watch. However, it is hard to determine how many people the advertisement reached as the official website that it is on does not provide statistics on viewership. A video titled CowzVR is coming soon! that was found on Chick-Fil-A’s official YouTube channel had over 12,000 views, and another video titled CowzVR Delivery that tied in to the virtual reality series found on the same channel had 39,000 views. I viewed the 360 video in 4K. 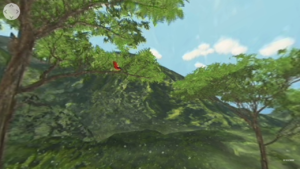 The virtual reality advertisement video takes viewers through a series of scenes in nature. 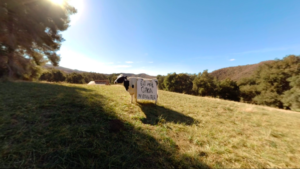 Viewers start by standing in a sunny field, surrounded by grass and trees with a cow standing in front of them with a sign that reads “eat mor chikin” hanging on its body. 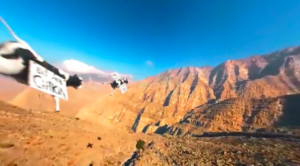 The viewer then gets to experience skydiving through the air, swimming in the dark depths of the ocean, go karting on windy track, skiing along a snowy mountain, hot air ballooning over scenic hills, and flying through the sky over a canyon, all depicted in the still images below. The same cow from the beginning of the story was among you in every scene, accompanied by other cows, swimming, skiing, flying, etc. among you. The story does not necessarily have a beginning, middle, and end, but rather, takes the viewer through a completely unique experience with every scene. Therefore, the advertisement as a whole is extremely location driven as it takes viewers to places that they likely could never have the opportunity to go to. There are no other main characters besides the cows in the scenes, but there are other people partaking in the activities such as sky diving and skiing. 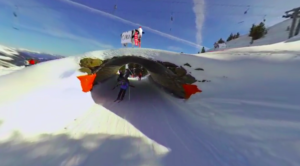 The content of the video was perfect for virtual reality, as the scenery and movement of the video makes it feel as though you are actually there. The only audio in the video derives from natural sound and the mooing of the cows. I detected few weaknesses throughout the video, as the quality is good and the overall message of the advertisement is clear; however, in some of the scenes, I did find myself struggling to find all of the cows who had writing on them. Also, the go karting and skiing scenes did make me feel a bit nauseous, as there was a lot of unsteady movement in them. 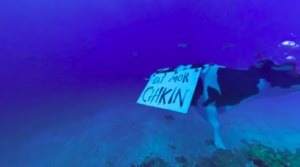 Though the scenery in the video did make it interesting, it may have been effective for Chick-Fil-A to have viewers to follow a story line rather than just view the cows. The rapid change in scenery helped to maintain my interest, but I question if Chick-Fil-A used the most effective advertising strategy possible in not having voice overs or any other advertising elements beyond the cows. Overall, the 360 video advertisement was successful and fitting for virtual reality, but I think that Chick-Fil-A could have implemented better advertising throughout.